WEST LAFAYETTE — Purdue University senior, Ryan Cline, has had his fair share of workouts inside the Boilermakers practice facility. Four years worth, to be exact. Although, others tell him differently. Ryan Cline: "I mean everyone tells me I've been here for 10." DF: "Wait a minute. To men, it seems like your freshman year wasn't that long ago." Cline: "To me, it feels like the same thing." And to think four could've been five. When Cline entered the program, he found himself playing behind guys like Raphael Davis and Dakota Mathias. He contemplated red shirting. Matt Painter (Purdue Men's Basketball Coach): "For him, he got into a tough predicament because Mathias made strides. Carsen Edwards came on board. So it was difficult. He'd get taken out of games and do nothing wrong. And that's hard for a player to understand." DF: "Well, that's hard for a coach to explain." Painter: "My explanation to it is 'someone else is going in, you're not coming out.'" But Cline still became a massive contributor as a freshman. Leaving Painter fine with the ultimate decision to let him play. Although, three years later, he's now averaging 12-points and 33 minutes a game. Painter: "I wanted to red-shirt him because I was worried about this: Worried about him not being able to get over that threshold that we had a pretty crowded back-court." Cline: "There are times when I want to go back to my freshman year and say 'Man I wish I would've red-shirted.' Just to have another one of these years again. I feel like my freshman year, I helped out, I contributed." But there no regrets. Not the Big Ten championship, not the sweet 16 runs, not even the beard, which former Boiler PJ Thompson signed-off on. DF: "From last year to this year, you look like you've aged five years. Maybe ten. Is it the beard?" Cline: "I think it might be the beard. The one that really got me to stick with it was PJ [Thompson]. And the one who really hated was my grandma. My grandma's calling my mom getting mad at me. Saying, 'He's gotta shave that off!' I don't know, I'm kind of liking it because I look like a little kid without it." DF: "That's gonna pay off when you're 40." Cline: "I'm hoping so! I'm hoping so!" So, maybe 40 is the new 20. 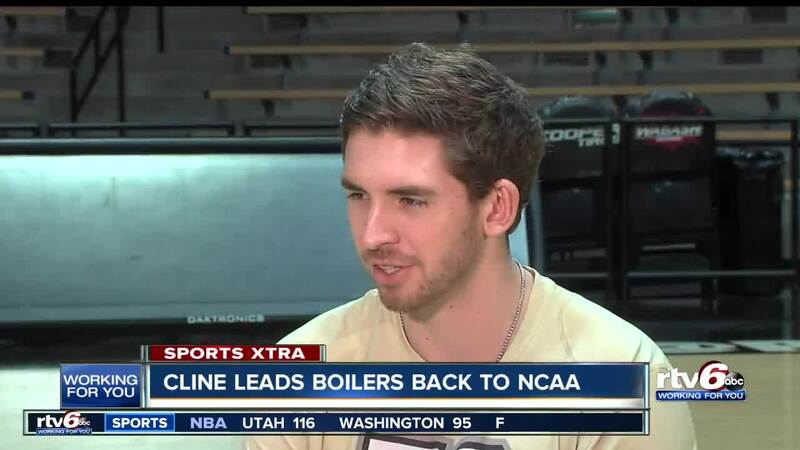 But for now, Cline's hope is that college basketball can last for several weeks to come. DF: "So from Carmel to here. What's next?" Cline: "Man, it's something I've been talking to my parents about. Playing overseas might be an option. [But] I'm going to make the most of it. It's gonna be memories that I'll remember for the rest of my life."